When I posted the Sociology Department Rankings for 2013 I joked that Indiana made it to the Top 10 “due solely to Fabio mobilizing a team of role-playing enthusiasts to relentlessly vote in the survey. (This is speculation on my part. )” Well, some further work with the dataset on the bus this morning suggests that the Fabio Effect is something to be reckoned with after all. The dataset we collected has—as best we can tell—635 respondents. More precisely it has 635 unique anonymized IP addresses, so probably slightly fewer actual people, if we assume some people voted at work, then maybe again via their phone or from home. Our 635 respondents made 46,317 pairwise comparisons of departments. Now, in any reputational survey of this sort there is a temptation to enhance the score of one’s own institution, perhaps directly by voting for them whenever you can (if you are allowed) or more indirectly by voting down potential peers whenever you can. For this reason some reputational surveys (like the Philosophical Gourmet Report) prohibit respondents from voting for their employer or Ph.D-granting school. The All our Ideas framework has no such safeguards, but it does have a natural buffer when the number of paired comparisons is large. One has the opportunity to vote for one’s own department, but the number of possible pairs is large enough that it’s quite hard to influence the outcome. 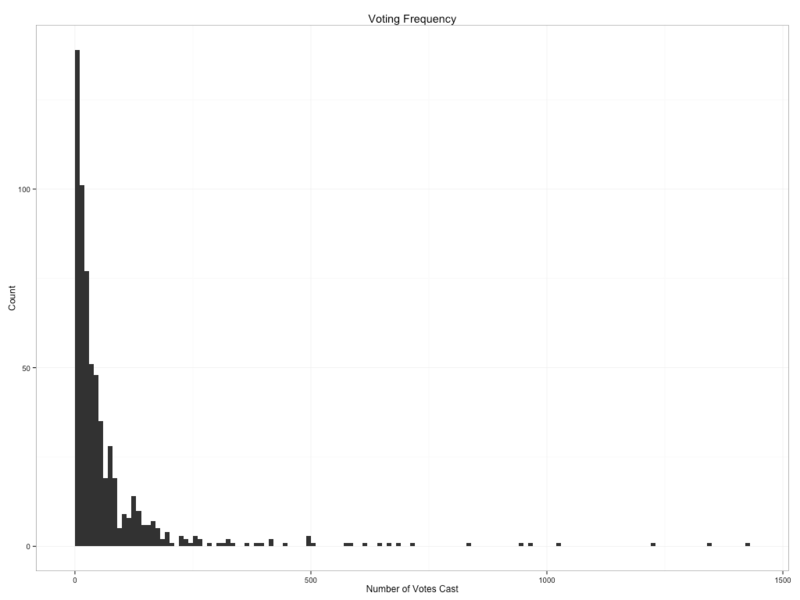 The distribution of votes across our 635 respondents has a very long tail. While 75 percent of respondents registered just over 70 votes before finding something better to do, and 95 percent of respondents were done after about 250 votes, a brave few carried on for much longer. Now, it’s possible for this to happen quite straightforwardly: the departments that emerge at the top of the overall ranking are by definition the ones that win all or nearly all of their head-to-head contests. And given the range of disagreement about which departments should win, as reflected in the error bars around the point estimates, there are quite a few such departments. However, in the case of our Supervoter, the favored departments were somewhat further down in the final rankings, making their 100 percent winning streak seem a little odd, particularly given that no other voters shared their view in several high-disparity cases. To preserve the confidentiality of the voting process—and bearing in mind that I do not have any identifying information whatsoever about the Supervoter in question—I will refer to the improbably favored departments by the pseudonyms “Hoosier University at Flowerington” and “The Fighting University of Our Lady”, and name the associated Supervoter phenomenon “The Fabio Effect”. Two other Supervoters also displayed somewhat suspicious voting patterns, showing a uniform but perhaps difficult-to-justify preference for Cornelius College and Twin-Citiversity, respectively, over all-comers. The original rankings still stand, all the same, if only because the original error-ranges easily cover the shuffling around that happens once you re-run the model with the offending Supervoters removed. But I thought it would be worth showing what the rank-order looks like when the Fabio Effect is accounted for. The hypocrisy of sociologists criticizing inequality and social stratification and nurturing it in practice is truly fascinating. The IP address map can give you a sense of where voters were from. Only 132 votes cast from Tucson AZ, compared to say 1,572 from Cambridge, MA. Durham, NC gets tag with 2,205 votes, but I suspect that includes Chapel Hill and maybe Raleigh. It would be fun to see what happens running the analysis ignoring all hometown voters, which might easy to implement if you exclude votes where state of school matches state of respondent. The juxtaposition of Graham’s condescension with what it implies about his opportunity cost profile is fascinating. Is there a direct relationship between rank and our proxies for rank that we should expect in this human-made endeavor? I have learned from this exercise that if I want to influence the outcome of an AAI poll, I need much more time, and perhaps a team of RAs. Graham– are we really equating excessive poll voting to societal inequalities? Really??? On what shallow planet does this similitude make any sense? Ooooh! This is fun! Kieran, does this mean that Purversity is the only R1 university in Indiana that is a paragon of virtue, or that the sociologists there are less clever than their neighbors? Jeremy, here it is. The lower-right quadrant now looks to be defined by a string of public universities—Iowa, Amherst, Minnesota, Arizona, Penn State, Arizona, UNC. But the upper part, I don’t know. Kieran, thanks. It’s really just the straight-up vertical distance I’m looking at. Last year I was talking to a prospective student who was trying to decide between Northwestern and Penn State. I could not help but noting to the student that it was an intriguing pair of finalists because if I had to pick the opposite department from Northwestern, I would pick Penn State. “Or Ohio State,” I added. Personally, I consider this a failure since I was trying to move IU from its traditional 10-15 range to top 5. I will have to increase the reward to 50 XP per vote. I don’t understand the “opportunity cost profile” comment. And I think i’ve got a pretty solid grasp of the theory of opportunity cost and marginal substitution. I don’t think the irony of a group of people who on balance argue for egalitarian organization and otherwise obsess over hierarchy within their own organization is subtle. But of course as a young buck I lack the argument from authority to support my claim. Darn. Sociologists who are occupationally interested in inequality tend to be interested in actual inequality out there in the world, with an eye toward redressing it in one way or another. People who try to make sociological interest in disciplinary rankings all meta/putatively-hypocritical usually have the idea that righteous folks should be disputing the premise that ranking different departments on a quality metric makes any sense. These same people would likely be aghast if you followed this style of reasoning out into the world, and starting saying that just because one school gets enormous resources and another school gets crap resources that there’s no reason to think that this means anything and really how dare you think that these sorts of things matter for the quality of education that happens within a school, etc., etc.. Sorry to double-clutch comment here, but seriously: imagine what a stunted world the sociological study of inequality would be if practitioners copped the same attitude about the measurement of occupational prestige as some people think about be more appropriately “sociological” regarding the measurement of departmental prestige. Still waiting for that estimation of my utility function from the resident font of anonymous courage, cleverboy@grahampeterson.com. Jeremy: you’re assuming too much about my politics. I don’t have a problem with inequality or stratification (though I do have a problem w/ organizational barriers and ossified mobility, say c. 8,000 bc to about 1700 c.e. worldwide). I do think the idea that the academy is an individualistic meritocracy is a total fantasy, and it is startligly asociological. Considering academic citation networks roughly follow a power law distribution, it looks to me like you’ve got an endogeonous preferential attachment mechanism working. People are mostly playig follow the leader. Is that suboptimal? Dunno. But it’s a far cry from an individualistic meritocracy. Moreover, it is philosophically inconsistent for sociologists to roughly maintain that individualistic meritocracies are an illusion everywhere except in their own profession. Classic pretense of knowledge. Ah, you’re one of those. You note the irony that sociologists say X, which is inconsistent with your made-up belief about what sociologists think Y. Perhaps the inconsistency is in your own mind. True, I’ve learned to never underestimate the wild things some sociologists may feel obliged to defend if they feel it puts them with the political angels. Even by that standard, though, probably few sociologists would defend “individualistic meritocracies are an illusion everywhere.” If there’s any doubt, consider how many sociologists are sports fans. Graham: It puzzles me that you think sociologists have any illusion that their field is a pure meritocracy (at least in the sense of non-tautological meritocracy that I suspect you mean). I don’t believe I’ve come across that particular delusion in graduate school or the sociological blogosphere, cf. this blog’s ongoing fascination with Val Burris’s 2004 ASR piece on the PhD exchange network. This topic was commented on at length last year following a post by Fabio . Omar’s comments (from which I’m stealing the phrase tautological meritocracy) and Kieran’s replies I found particularly worthwhile. Is my prior that sociologists are on balance concerned about organizaional inequality and social stratification incorrect? I’ll of course update my prior if so. Jeremy: your argument is thinning and ad hominem thickening. Jim: thanks. I’ve never seen a sociologist challenge the standard notion of meritocracy in the academy, and have seen quite a bit of sociologists celebrating rank and using it as a proximate signal of quality, and I would suspect deserved reward. But my sample is small. I’m just going on rough estimates of say the names of significant subfields in sociology. Whether it’s an issue of individual merit or not, nobody has been able to demonstrate that either (1) sociologists don’t in fact think ranks are useful signals of organizational and professional quality, nor that (2) this belief directly contradicts the idea that hierarchcal sorting is a good thing in society. Should we expect the academic product to benefit from intra-academic redistribution? What about an academic safety net for people who fail comps? I find people often experience a striking disconnect between the macro-level narratives they believe and their lived experience. As social story-tellers I think the onus is on us to examine this disconnect in our own backyard. Also, it’s worth noting that I hold no reservation against sociologists specifically here. I would make a similar argument to economists that it’s insane to argue that the FDA and Unions destroy welfare by erecting entry barriers, and to support their own tenure system so cheerily at the same time. Sure, you’ve underlined my starting assumption here, which likely diverges wildly from that of sociologists — that the distribution of wealth is determined by ideas slash the network of knowledge, as against capital accumulation. The capital accumulation story is just wrong. Price theorists tortured capital data for more than a century — note that now they talk about growth and the distribution of income in terms of human capital (i.e. skills, knowledge, and the network I cited). Growth theorists also agree with the assessment: growth comes from a growing pool of good ideas, not from Marx’s “mystical cabal of capital,” or the neoclassicals’ “rate of investment.” These are some of the strongest, empirically verified results in modern economics (in contrast to a mountain of elegant but untested economic assertions!). And don’t take their word for it. Capital Fundamentalism has for instance produced net-negative results in developing countries, in terms of aid-given (trying to jump-start the Cabal). So I see a much clearer one-to-one map between the social forces that distribute prestige and pecuniary rewards in the academy, and those in the economy. Ideas agglomerate. There are productive payoffs and efficiencies which accrue to good ideas. Thus wealth agglomerates . . . to HYP. Blessed be thy name. Thy kingdom come. Thy will be done. On earth as it is in the academy. Ok, I’m lost. Is it good or bad to click the survey 10,000 times to try to make your own department look good? Graham, I think you’re under a misapprehension about how most of us are treating this ranking (well, how I assume most of us are reading this). Kieran framed this as a reputational survey. Nobody has held it up as direct measure of quality, only prestige. As the contributors to the blog know, the literature on status effects in organizational sociology is vast (as I recall from when you visited my department’s prospective students’ day your undergrad background is in econ not soc). Nobody believes status=quality but that it is often a loose signal of quality, which is attenuated to varying degrees. The question in academic sociology is whether we have any better measures of quality at our disposal (I’m putting aside for a moment whether it might be the case that there is no meaningful distinction to be made between status and quality (read merit) in academia). If you’re unfamiliar, I recommend you begin by read pretty much anything by Joel Podolny. Michael Sauder has written extensively on ranking of universities, specifically about the U.S. News Law School rankings. Sorry, Gabriel. No offense intended. I apologize for the wording. Cool simulation. Well, since we’re going to air out one another’s credentials to establish ethos, I may as well run with the transparency and leverage mine to my own advantage. Not one sociologist I’ve talked to in the last month and a half about picking a department — something like maybe 30 professional sociologists at top 20 departments — has failed to confront rank IMMEDIATELY in their departmental comparisons, nor failed to continue to explore what those ranks signal qualitatively. I don’t lack analytical tools here, Jim. Everything I’ve said comes from my reading of liberal political philosophy, price theory, and networks. I appreciate the citations to sociology of science literature and will explore them, but I should note that your flagging of my disciplinary stature (new admit; from economics), evidences precisely the status-driven behavior I meant to point out among sociologists. Graham, all I meant in citing your background was that you might not be aware that in fact lots of sociologists have concerned themselves the issues you suggest they’re blithely inattentive to. I’m sorry if you took that as an affront. Well, I’m open (clearly), so I’ve been particularly open to conversations comparing my offers. I don’t think sociologists are blithely unaware of how rank-sorting impacts their profession. My claim was that stratification and inequality scholars appear strangely unaware of what their lived experience of (informational and material) resource allocation would imply about the broader society. I’ve also had the opportunity in these months to meet a tremendous number of students who trained as sociology undergraduates. By their lights or yours — these kids have all come to believe in equality of opportunity. It seems pretty obvious to me that equality of opportunity in time t is a function of the equality of results in t-1. I sense (and will clearly spend many years working on) that neither equality of opportunity nor of result are possible in a positive sense, and often socially destructive in a normative sense because of the interventions both inevitably recommend. Some degree of limited mobility for individuals is I think the best we’re going to do. But that’s just a hunch. Geesh, i would never have rigged the rankings if I knew you people were going to get so touchy about it! Pretty sure what set everyone off was my suggestion that inequality isn’t a bad thing, and that sociologists in fact promote it in practice. For my own sake I hope I don’t lemon out in grad school, because it will make all this attention getting behavior look extra stupid. For every Dr. Talc there’s an Ignatius J. Reilly. Big Z: I probably should, but between invading comment logs on the internet and dressing up as a 17th century American colonist and shouting profanity about homosexuals with my reactionary friends, I never find the time. Who knew that Michael Marotta changed his name and learned how to string a (somewhat) coherent thought together. Long live OrgTheory commenters! Graham, there are just so many issues here that I don’t want to touch. But as one of your fellow prospective students this cycle, I feel my own experience gathering data on departments and trying to understand the fruits of my inquiry within the more abstract and hard to interpret issue of prestige could prove an instructive counter point. In the first place, my own personal case suggests that there may indeed be a healthy dose of meritocracy in the discipline. My parents made very poor decisions that had severe impacts on my educational opportunities growing up. But I have always been an exceptionally hard worker, and I somehow had the wherewithal to make decisions that paid off in the long run, even though I had no guidance and none of the forms of capital that we so often correlate to positive outcomes. I failed miserably at getting into grad programs in sociology last year, but I responded by working even harder and devising better strategies, which really paid off. Looking at my case with the concept of mobility in mind, it is striking to consider that a foster child whose mother did not graduate from high school breached the gates of elite programs. Not only this, but many other students that I met had overcome their own obstacles to mobility. I am talking here about one top 5 program, another in the top 15 (which some think should be higher on the rankings…), and an Ivy league school with a descent program. These are places that I would not have been invited to if people in the discipline were practicing the kind of hypocracy that you have charged them with. Okay, so that’s on the way in to a department. How about on the way out? Well, if a good mix of students are getting into top departments despite their lack of pedigree, how hard can we be on hiring practices? Maybe it’s more important to look at how many of these hires have biographies that suggests a good degree of mobility in life. I think you are totally right that prestige is more or less equated with quality of training, but the situation in which that signal is considered and used in decision making might be very different than you expect. I will let someone with actual experience on a hiring committee give a general idea for how a PhD on the market is seen in light of their alma mater. The other point I would like to make is that the top 15 program I recently visited leaves no fledgling sociologist behind. Not only were current students at this program from varied backgrounds (which further evidences point #1), but they go through a program that pretty much makes them succeed — it is pretty much a safety net. The discipline recognized this strength some years back, and I think that speaks to the fact that sociologists really are interested in ways to grant equal access to opportunity and to help people succeed in the discipline, as in life at large. As a sociologist who studies inequality, I must say I disagree with the assertion that we all undermine our high fallutin egalitarianism in our daily lives. In unrelated news, I do like a new grad student who opens a letter with “Dear Sir,”. It’s customary in some sections of The Economist’s discussions, when addressing the magazine itself as against the idiot xenophobes in the comments roll. Note the letters to editor of the print edition. I don’t deny the existence of demonstrable, manifest egalitarianism both among sociologists and in society. Per usual it’s a question of relative magnitudes, of both what exists and is possible in terms of a flat (=/= just) society. Grad student visitation day at IU and Duke will be reeaaal interesting this year. Mr. Peterson: See, you started this thread with a snarky statement calling folks hypocrites. A problem with being a reasonable sociologist is that it’s hard to discern precisely which direction snark is coming from. When I read your first post, I thought it was moral-entrepreneur-sociologist-calling-out-others-for-not-living-up-to-his-vision-of-sociological-dogma (that is, snarking from the left, or “portly snark”). Then I realized you were, instead, nonsociologist-who-thinks-he’s-smartly-caught-sociologists-not-being-consistent-with-his-caricature-of-what-sociologists-are-supposed-to-think (that is, snarking from the right, or “starboard snark”). Nobody really likes when somebody comes into a discussion being sanctimonious because the people involved aren’t living up to that person’s conception of what their type is supposed to think. In effect, nobody likes being reduced to a type, just like those folks who bristle when being (correctly) recognized as “one of those“. In any event, on your Internet travels, you might want to check out the Sociology Job Market Forum bulletin board sometime. There, you will find plenty of people who are extremely eager to defend the idea that one of the largest-scale, long-lasting, and pernicious systems of hereditary stratification in the history of the world is exactly the right metaphor for the situation of a student who made a voluntary decision to matriculate in a graduate program with a modest reputation and a poor historical record of placing its students. You may find such folks suitably consistent with your conceptions of sociology. I dunno. I’ve had a blast with all the grad students I met at Chicago and Wisconsin. In fact they put me with one of Olin Wright’s star students at Wisconsin and we had a blast doing battle over Capital. I’ve had similarly vigorous conversations about methods, markets, econ v soc, inequality, and so on. I felt a genuine respect and bond with almost everyone I’ve met. So far as I can tell I love sociologists. I’ve met more crazy smart people among the students and faculty at visits in the last month than I have in the last ten years. It’s going to be tough to say something useful in a crowd of such thoughtful people. No offense taken. I would have described it as delusional too until Kieran suggested taking it seriously and I found it was indeed plausible. competition is a useful mechanism in some situations — deciding the winners of contests involving balls, ensuring that heart surgeons are well-trained, etc. this, however formally similar, has very little to do with the desire i have for my brother-in-law to make enough money in his job as a mover to provide for the sustenance and development of my nephew. i reject the idea that valuing both makes me a hypocrite. i don’t think that this point is subtle. That would depend on your definition of “enough” and “development,” which are likely (assuming you even remotely approximate the representative agent over the last 250 years or economic growth) inherently relative and insensitive to absolute increases (which have been on a conservative estimate the order of a factor of 15) in the amount of “enough” on the table. The hedonic treadmill is the root of progressive politics, and just so. But it surely doesn’t legitimate a politics of envy. Anyway the economy doesn’t run on rapacious competition. It runs on cooperative institutions. @jeremy: They didn’t call him the King of All Soc Bloggers for nuthin. Daayyymmm. And Omar even peeked his head out of his hidey-hole. Just like old times! Wow, sometimes I have to very deliberately remind myself that the protagonists here are grown men, some with actual (not virtual) wives/children/duties/responsibilities, beyond teaching 2-2 and messing around on the internet. Hats off to the whole gang, from Kieren and Neal to Jeremy, Gabriel, and Fabio! TR: you forgot the OLL.